Mars is thought to have had a watery past, but when exactly it transitioned to its dry and dusty present is up for debate. Now, though, a team of scientists studying the marks on a young Martian crater has found signs that waterlogged debris flowed down the Red Planet's slopes surprisingly recently - within the last million years. 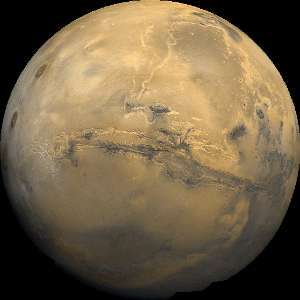 The findings, described in the journal Nature Communications, help to fill in an increasingly complex picture on the recent Martian water cycle and have implications for the possibility of life. The team of European scientists looked at the mid-latitude Istok crater, which has so many well-defined gullies running down its steep sides that they overlap. Given that the crater is surprisingly young - 1 million years old at most - it means that whatever falling material carved these gullies was happening in the last million years. But was the debris dry or wet? To find out, researchers used data from the HiRISE camera on NASA's Mars Reconnaissance Orbiter to map out the gullies in three-dimensional detail and compared them with gullies carved on Earth. They found that the debris flows likely would have had about 20 percent to 60 percent water content in them in order to carve the tracks that they did - and they did so frequently, with sudden slides happening every 10 to 100 years, said lead author Tjalling de Haas, an earth scientist at Utrecht University. That's comparable with the rate of wet debris flows in dry areas on Earth, such as the Atacama Desert. "It's a surprising result, but it's really solid," de Haas said. "It's just what the evidence said." To make these tracks, the Istok crater would have to have been much wetter than previously expected for this time period, the researchers said. But there's a good explanation for this extreme wetness: The Red Planet's tilt has shifted over its eons circling the sun, from a slight 15 degrees to a strong 35 degrees. When it's got a sharper tilt, the sun hits the ice at the poles and causes it to sublimate, or escape into the air as water vapor; that extra humidity helps to power a stronger water cycle. In fact, there's so much water that it can creep down to "warmer" latitudes, toward the equator, where it might even snow or deposit frost. When that ice or snow melts, the water soaks into the ground, and that soggy debris eventually falls prey to gravity on the steep crater slopes, sliding down and leaving the telltale tracks behind. "This is really excellent work because what they've done is they've been able to actually pinpoint the time when this was taking place by dating the crater, and then looking at really good models for debris flows to figure out how much water is needed to form them," said James Head, a planetary geoscientist at Brown University who was not involved in the paper. It's unclear whether the Istok crater was a lone oasis on a very dry Mars or whether these sorts of local wet environments were found all over the Red Planet. Still, the findings have implications for the possibility of microbial life on Mars in its more recent history, scientists said. "On Earth, if you see liquid water, you can predict with pretty much 100 percent certainty that you'll find evidence for life," said Jay Dickson, a planetary scientist at Brown University who was not involved in the study. "We don't know if Mars has the same relationship, but we can surmise that these would be the best places to look - places that had recent exposure to liquid water. And the crater that they're looking at might be one of those sites." Could water have carved channels on Mars half a million years ago? Think you might be confusing real science with mythology. Just a guess. Mythology is one of the cornerstones of EU. All of the Mars rovers have traversed a total of less than 120 miles of Martian terrain. All other observations are made from orbital distances. The conclusions - nay, conjectures - concerning its geological history are pretentious and arrogant. This, especially considering that earth's geologists are drawing their conclusions of our own planet's mysterious geological history mere inches away from their dig sites using hand tools. Then again, "- within the last million years" kind of says it all. Because "within 1 million years" is significant in Martian terms. It's not back in the Amazonian or Noachian. They don't need to date it to a week last Tuesday for it to be significant. Well, Mars's history is ours so perhaps we can look at our geologic history and see the same kind of change? Which seems to be the case so the question is where is the energy coming from ? This article says Mars' unusual orbit is the cause. I wonder if our sun, Sol, is the cause? Or as NASA has proposed our solar system's passage thru the galactic arm? I think they were talking about Mars having a highly variable axial tilt. Earth's is variable too, but only by a few degrees. Mars has a much larger variability. Meaning places that are no longer at the sub-solar point at all, used to be in the past. So yes, the Sun is probably responsible. Due to the fact that it is warming the surface. We already know that there are large amounts of ice beneath the surface. Heat + ice = water. Interesting how the lack of a large moon (means twice the maximal tilt) means increased habitability in martian sized terrestrials. @baudrunner: The rovers start to add up to significance, sees recurring geology, and the orbiters can resolve details down to tens of cm besides that they can characterize the materials remotely. Conjectures becomes conclusions when they are well tested and the only remaining predictions. That is what these scientists were able to do. We don't see you come up with a better prediction for the debris flow features. So, you fail, they win.